After suffering through a roller-coaster ride on my way back to home on disrupted Mumbai Roads, I felt what the heck our government is doing? Where does the huge money collected by the way of direct taxes, indirect taxes, duties etc. is going? I kept thinking about the same throughout and decided to do an article on “Why I will never pay taxes in India”. Disclosure: I am Jay Thadeshwar, a Management student and a blogger. I don’t earn a significant amount as of now to pay taxes but had I been earning, I would have not paid the taxes. I remember I had asked a question to Mumbai police commissioner in 2009, “Why we don’t have metal detectors at every railway station? and Why do we have 50 ways to get out of a railway station without any security checks?” and his answer was, “We don’t have enough money to spend on security and put metal detectors everywhere”. & you have money to spend crores to protect Rahul baba??? Humans are not valued in this country…..Sorry….. AAM Humans are not valued in this country. If you are a politician, you would have a bunch of policemen and CRPF Commandos moving around you to guard you…..but if you are a common girl like “Nirbhaya”, you don’t deserve safety as you are just another piece of flesh and bones among 1.23 billion people in the nation. And you get a hit by police irrespective of your gender when you revolt. Insufficient pay to police in this nation has corrupted the department to such an extent that it’s takes lots of guts to trust police now…..In short…..our security mechanism is screwed up. And when you face such issues….some old, ignorant, illiterate, careless, ruthless, irritating, insensitive, irresponsible Home Minister like “Shushil Kumar Shinde” will come and piss you off even more. I am not a fool to pay money to get even more endangered. Do I need to say anything??? Every year, THOUSANDS OF CRORES are allocated to different states and municipal corporations for the Infra structure maintenance. Actually this money goes in to the pockets of local MLAs, Corporaters and Chhotu-Motu politicians. Who the hell cares whether we have road or an ugly exhibition of POTHOLES. National Highway-8 doesn’t even look like a ROAD in monsoon. Crores of rupees are allocated for maintenance which goes into bank accounts of local politicians and sub-contracting takes place royally which screws the quality of roads horrendously…… and they are CHILLED about it….”Kisko padi hai?? paisa mil raha hai na” This is what you get when you pay taxes. Everyday I hear news of infants dying of inadequate facilities at civil hospitals across India. If you haven’t visited a Civil hospital ever, visit once….you’ll feel cursed for being privileged. In West Bengal when 45 infants died because of the lack of adequate facility & our so called “DIDI” comes out and says, “We are a poor state” and the same DIDI spends 9+ crores to celebrate victory of a privet sports club “Kolkata Knight Riders”. Shhhyaaaa man…..I mean no words for criticism. The World Bank estimates that India is ranked 2nd in the world of the number of children suffering from malnutrition. Mayavati spends 2500 Crores+ to build a giant garden and put his idol (PUTLA) in the middle of it while people in UP don’t know the meaning of good living. Maharashtra has been facing drought for last few years. Is it nature’s furry ??? NO According to Times Now report, water from most of the rivers is diverted to “SUGAR FACTORIES” through a huge network of pipelines connecting most of the dams and rivers. DO I NEED TO SAY WHOM THESE SUGAR FACTORIES BELONG TO??? To facilitate this scam, they changed the law. Pre-2003 amendment, Agriculture was the 2nd on priority list of water usage after drinking water. Since the politicians wanted their sugar factory to run smoothly, Agriculture was shifted to 3rd place in priority list preceded by Industrial requirement (SUGAR FACTORIES’ requirement). And then we hear farmers committing suicides in Maharashtra. I feel those are murders and not suicides….. And the answers our politicians give are awful. I need not say further on this as you all know how they are. SIMPLE : I would not pay tax to murder those innocent farmers. After 4 years, or rather 9 years (5 years of UPA-I and 4 of UPA-II), in office the scam-tainted UPA government is reeling under several setbacks over corruption controversies. Here’s a look at the top scams. Coal scam: (2012) The CAG report on the irregularities in auctioning 194 coal blocks created a massive uproar in political circles with the government being heavily criticised for causing a loss of Rs.1.86 lakh crore to the exchequer. The government’s decision to not auction 194 coal blocks between 2004 and 2011 meant that the country lost a huge amount in revenue. The figure was initially believed to be more than Rs.10 lakh crore, but the CAG chose to keep PSUs out of its final report, bringing the figure down to Rs.1.86 lakh crore. 2G spectrum scam: (2008) In 2008, the country issued 122 new telecom licences to several domestic companies that had little or no experience in the telecom sector, and at a price set in 2001. It is estimated that the spectrum scam led to a loss of Rs 1.76 lakh crore to the government. Chopper scam: (2012) Former Indian Air Force Chief Air Chief Marshal S P Tyagi was allegedly paid bribes to swing a Rs 3,600 crore deal for procuring 12 choppers from Italian firm Finmeccanica to ferry VVIPS. Tatra truck scam: (2012) The Enforecement Directorate had registered a case under the Prevention of Money Laundering Act (PMLA) in April, 2013 against Vectra Chairman Ravi Rishi and few other firms after former Army chief Gen V K Singh had alleged that he was offered a Rs 14 crore bribe in September, 2010 to clear the purchase of a tranche of 1,676 Tatra trucks for the Army. CWG scam: (2010) Former Commonwealth Games Organising Committee chairman Suresh Kalmadi and nine others were charged for allegedly cheating, conspiring and causing a loss of over Rs 90 crore to the exchequer in CWG-related corruption case. Cash-for-vote scam: (2011) On July 22, 2008, three BJP members – Ashok Argal, Faggan Singh Kulaste and Mahavir Bhagora – had flashed Rs1 crore cash in Lok Sabha alleging that the money was given to them by floor managers of the UPA government to secure their support during the no-confidence motion after Left parties withdrew their support over the Indo-US nuclear deal. Amar Singh, the Rajya Sabha MP was at the heart of the cash-for-votes exchange. His home was the place from where the money was allegedly disbursed to willing MPs. 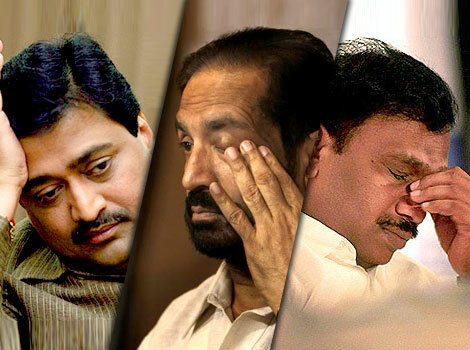 Adarsh scam: (2012) The Adarsh controversy had erupted with reports which alleged that the land belonging to the defence had been given away by the state for the society where bureaucrats got themselves flats. It was seen that even politicians and army personnel connived to grab apartments in this plush 31-storey Colaba building overlooking the defence area. Seems like they have got into a competition of committing the biggest scam possible. I am not stupidousidiotousmoronocally lunatic to pay money to fill these monsters’s bank accounts with money…. If you calculate the amount it’s more than 13 LAKH CRORES …… Freaking 13 LAKH CRORES……… And then it comes back to us…..Prices are increasing, rupee is depriciating, inflation is sky-rocketing, people are dying of starvation, our soldiers getting attacked, terrorist enjoy treats of killing hundreds of people…and our PM celebrates his MAUN-VRAT for life. I EARN TO FEED MY FAMILY and not for those gruesome politicians. I would rather go to a temple and feed few people or sponsor some kids’ education but would never want to feed those devilish dogs. This is my personal opinion which came out of frustration. I know it’s illogical and impractical ….but where does our government work logically?? I am sure many of you must be feeling the same. I welcome your feedback and views on the article. Feel free to comment.